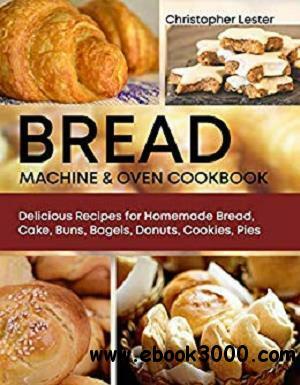 Download Torrent "Bread Machine & Oven Cookbook: Delicious Recipes for Homemade Bread, Ca..."
The only thing that can be better than bread is freshly baked homemade bread. Fragrant bread, muffins, and buns will brighten up a cloudy day and make an excellent complement to your morning cup of coffee and heart-to-heart talk. The Bread Machine Cookbook is a collection of simple and refined recipes of bread and pastries made of common ingredients. All you must do is to glance through the book, select a recipe you like and cook it! This book will make a great addition to your bread machine and your bread machine cookbooks collection! The Bread Maker Machine Cookbook includes:IT'S THAT SIMPLE. You will find useful tips, baking ingredients, substitutes and toppings for baking healthy bread and pastries at home.EAT A TASTY AND FRAGRANT BREAD AT HOME. You will find easy-to-follow but original sweet & savory bread recipes for your home bread maker and oven.WHAT ELSE CAN I BAKE? Try cooking buns, muffins, bagels, breadsticks, baguettes, crostini, pies, tarts, quiches, focaccia, bruschetta, calzone using your bread machine.BREAD LOOKS SALIVA-DROPPING. Lovable photos, clear & simple instructions, nutritional information will depict you the ready hoped-for product.HOW LONG DOES IT TAKE TO BAKE? Each recipe is furnished by cooking and preparation time.USEFUL UTENSILS HELP ENJOY YOUR BAKING. For your convenience, we've put the list of useful kitchen tools for the perfect baking.SOMETHING INTERESTING ABOUT BREAD. At the end of the book, you meet incredible facts about bread history.FIND ANY RECIPE AIRILY. You can find any favorite recipe in the Table of Contents by the main ingredients, or at the Recipe Index alphabetically. Fresh, fragrant homemade bread, soft inside and crusty on the top, is not only much tastier but also healthier than the one you can get in a store. With a bread maker, you can make bread from different types of flour: wheat, rye, rice, corn, etc. It is also up to you what to add in your bread: Cheese and olives? Garlic and nuts? Tomatoes and mushrooms? Oranges, bananas, and apples? Which do you prefer? Choose it and taste it! Proven recipes for homemade bread and buns. Recipes of various fragrant baking made of different flour types with different additives come with detailed descriptions and step-by-step instructions.